One of the most entertaining, exciting and glamorous race weekends returns to the Sepang International Circuit this month (15-16 June) with Malaysia once again being given the honor of hosting the third round of the prestigious 2013 AUTOBACS SUPER GT Series. Formerly known as the All-Japan Grand Touring Car Championship (JGTC), the Super GT Series is a grand touring car race series promoted by the GT Association (G.T.A.). It was first established in 1993 by the JAF (Japanese Automobile Federation) via its subsidiary company the G.T.A. (GT Association). 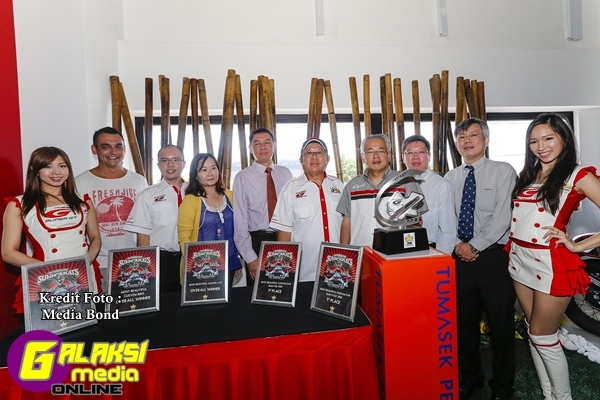 The Malaysian round of the AUTOBACS SUPER GT Series is being organised by JPM Motorsport and this will be the 13th consecutive year that the Series is back in town to thrill fans. It is also the 20th year the Series is being organized. Internationally recognized for being one of the world’s fastest and most exciting GT racing series, the 2013 AUTOBACS SUPER GT Series consists of eight rounds, and is divided into the GT500 and GT300 classes, gathering what is the reputed to be the largest ensemble of latest Japanese sports cars with manufacturers the likes of Lexus, Honda, Nissan, Toyota and Subaru, as well as continental marques that include Porsche, Lamborghini, Ferrari, BMW, Mosler, Chevrolet, Audi, Aston Martin and Mercedes-Benz. The Series is also a playground for top Japanese drivers and some of the world’s top racing drivers among them, former Formula 1 driver and Super GT champion Ralph Firman who drives the Honda HSV for AUTOBACS RACING TEAM AGURI this season; former South American and German Formula 3 driver Joao Paulo de Oliveira driving the Nissan GTR for Team Impul; former Le Mans driver Seiji Ara; Michael Krumm the 2011 FIA GT Championship GT1 Series champion; and former Macau Grand Prix winner Andre Couto. Also racing in the Series and giving local fans more to cheer about is Malaysian Fairuz Fauzy who alongside Japanese Yuki Iwasaki, drives for team APR Audi R8 LMS Ultra in the GT300 class this season. The pair’s best finish so far has been 14th place in the opening round of the Series at the Okayama International Circuit in April. In round 2 at the Fuji Speedway in Shizuoka, Japan Fairuz and Iwasaki and a third driver Kenji Kobayashi came in 15th place. Another hot favourite will be the Malaysian-backed Petronas Toms SC430 Team which had only recently clinched victory at round 2 of the AUTOBACS SUPER GT Series at the Fuji Speedway in Shizuoka, Japan. The team, competing in the GT500 class, is spearheaded by the pair of Kazuki Nakajima and James Rossiter. Nakajima is the 2012 Formula NIPPON Series champion, while Rossiter was formerly a Lotus factory driver and test driver for the Force India Formula One Team. Race fans are also in for another treat as for the first time, they will be able to see fast action on the track by hybrid cars competing in the GT 300 class. The competition is led by the Toyota PRIUS GT which recently secured the first ever victory for a hybrid car in the SUPER GT series at round 2, and joined by a fleet of MUGEN CR-Z GT cars. “We’re gunning for a phenomenal race weekend with lots of action and activities on as well as off the track. We’re working on a whole host of activities and attractions and all I can say is that it’s going to be exciting for everyone, race fans or otherwise,” said JPM Motorsport Managing Director T.J. Chin. In 2013, with the aim to further improve the experience of spectators and provide greater value to sponsors, JPM Motorsport has come up with the theme of having a 5-Star SUPER GT! The components are: the SUPER GT Race, the Affin Bank Motorshow, a Japan Town by Sachi, the Biggest Superbike Gathering and a Dash Berlin ‘Music is Life’ World Tour 2013! And unique to SUPER GT, fans can meet and greet the drivers and teams during the Pit Walkabout, where the Race Machines and hot race queens will be present. On Saturday, consistent with the SUPER GT tradition, the pit walkabout session is free for children under 12 and their accompanying parents too. This year’s event will also witness the very first Asia Cup race organized by Meritus. Off the race tracks, grass root racing activities in the form of the Ultra Racing Gymkhana & Drifting, will encourage enthusiasts to compete. custom muscle cars as well as other street machines which will take place in Malaysia and co-organised by JPM Motorsport in the later part of the year. JPM Motorsport will also be out to establish a record in the Malaysia Book of Records. This year, instead of the Biggest Supercar and Performance Car record that it managed to set with the help of various car clubs in 2012, the company will be out to create the record for the Biggest and Noisiest Superbike Gathering on track in Sepang International Circuit. This will be the first time the track will accommodate so many bikes on the track in a single event. Moving away from Automotive related activities, another Star to this year’s race weekend is the Japan Town by Sachi, and JPM Motorsport in collaboration with sponsors such as Code 10, Luminox and OK is attempting to make the audience feel like they are watching a Japanese Racing event in Japan during summer. Finally, when the sun goes down on Saturday night, event goers, or more specifically party goers will be treated to the Dash Berlin ‘Music is Life’ World Tour. This tour, touted as one of the most anticipated party event of the year is organized by Global Sound Music together with JPM Music and is expected to provide an unforgettable “let your hair down’ party experience. And for partygoers, they are also entitled to attend the race, making it an adrenaline filled weekend. “There you have it, a 5 Star event which we hope will make this year’s event more thrilling, engaging, glamorous and spectator-friendly for all those who attend and sponsors alike,” said Chin. JPM Motorsport is also inviting race fans to bring their entire family to the Super GT weekend, and have put in place various attractions that include a special Kids Zone and musical performances to keep everyone – including non-race enthusiasts – happy and occupied. Super GT fans will also be able to catch the action of the 2013 Malaysian SUPER GT Queen Search Pageant. The pageant is being held for the third consecutive year, and the crowned winner will stand the chance of joining a line-up of Japanese GT Queens in Japan with objective of promoting the sharing of knowledge, expertise and talent between Malaysian and Japanese GT queens. Tickets for the Malaysian round of the AUTOBACS Super GT Series are priced at RM100, and fans can obtain it online via www.supergt.com.my, or tune in to the entire season’s updates on www.facebook.com.my/supergt.my. Aspiring candidates or the 2013 Malaysian SUPER GT Queen Search Pageant meanwhile, can log on to the SUPER GT’s Facebook at www.facebook.com/supergt.my to obtain updates about the pageant.